A series of Canadian whisky reviews should start with the royalty of Canadian whisky, Crown Royal, and one of the standards by which all other Canadian whiskies should be judged, only because it has been around for 80 years and is still immensely popular. Almost everyone who drinks whisky has heard, tasted or observed Crown Royal sitting on the back bar. It was one of the first super premium spirits when it was created in 1939 for King George VI and Queen Elizabeth during a royal visit to Canada. Whether the Seagram’s company knew it at the time, or not, that was a stroke of genius for advertising. Especially in a country that had very close ties to England. This spirit was only available in Canada until 1964 and then for the past forty plus years has become a brand recognized around the world. How long is Crown Royal Aged? It was originally sold as a ten-year-old whisky but may have had whiskies that were much older in it. In the early days, up to 40 different whiskies were used to make Crown Royal, this allowed for the creation of a unique spirit where no single component was identifiable. The distillery where Crown Royal is made (Gimli, Manitoba) has over 1,000,000 barrels of whisky to pick from to create the Crown Royal blend. Originally the oldest whisky component was 35 years old, but after a few years, it was reduced to a 30-year-old. At the present time there is no information or age statement on the oldest or youngest whiskies used in the Crown Royal blend. Crown Royal is the number one selling Canadian whisky and the number two selling Canadian whisky in the United States followed by Canadian Mist, which holds the number one spot, but as of late Crown Royal is taking over certain markets, partially from its NASCAR involvement. It is also the name of a Run DMC album, so move over P.Diddy and Busta, Crown Royal is moving in and Courvoisier is out. Crown Royal is recognized around the world and sells over three million cases per year and is the most profitable brand in the US spirit industry. Not bad for a blended whiskey. For comparison, Johnnie Walker Red Label sells 6.8 million cases per year. How to drink Crown Royal: Best served with a splash of water/soda or in the always popular Crown and Coke. Nose: smooth with rye, toffee and some fruit. Slightly alcoholic to start but as the minutes pass the nose becomes more intense with chocolate making a pleasant appearance. Palate: tastes smooth with a little rye bite. Semi-sweet, but not as sweet as other Canadian whiskies. Finishes: fairly long with a smooth dry rye and oak spiciness. 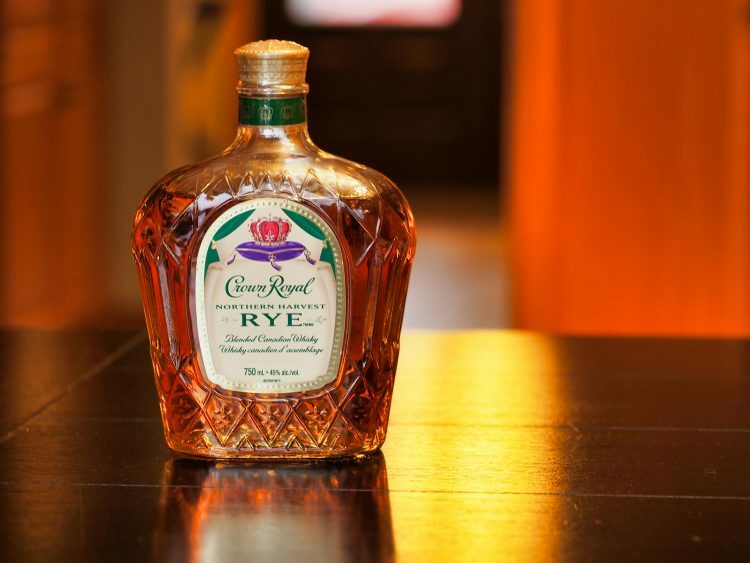 Notes: Crown Royal has more bite than one would expect from the advertising. This is a good thing because it provides a lot of character to the whisky. Adding just a few millilitres of water makes some subtle but enjoyable changes. The nose remains about the same, but most of the alcohol disappears leaving just the rye, chocolate and fruit. The water brings out a lot of sweetness and more of the rye characteristics. The finish is still spicy with the oak being very present. The finish is long with the sweet spice and oak. The big change is the perception of the sweetness on the palate and in the finish. When comparing to Jameson Irish Whiskey, the Jameson has a lighter colour (straw) than Crown Royal and the nose is slightly alcoholic with malt (maybe grass) and subtle fruit. On the palette, Jameson is malty with fruit and is very smooth. Once you add water the malt becomes even more evident, and whisky smooths out substantially, whereas the Crown Royal maintains its spiciness and becomes sweeter, but still has that all-important oak and spice. Given a choice, I’d go with the Crown Royal. When compared to Jack Daniel’s whiskey, it’s a no contest. Crown Royal has more flavour and is smoother. Maker’s Mark whiskey is a different story. But with a price 50% greater, Crown is a better option, unless you’re rich. Then who cares. Crown Royal is a pleasure to drink. It is smooth in that Canadian way, but not flavourless and definitely has a unique character. It is popular for many reasons, but for me, it is a spirit that is enjoyable on the simplest level. It’s not overpowering like some scotch and bourbons, it’s smooth so almost anyone can enjoy it straight or with water or even a Crown and Coke if that is your preference. Drinking a decent whisky, with good company, is better than drink the best scotch by yourself.